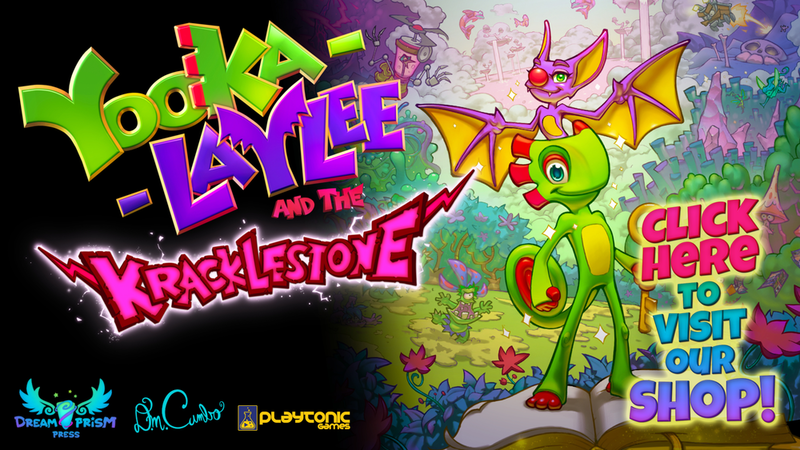 LAST CHANCE to support Yooka-Laylee and the Kracklestone on Kickstarter! Visit the Kickstarter Campaign page and choose a reward before time runs out! The campaign ends tomorrow at 11:30am Pacific / 2:30pm Eastern / 7:30pm GMT. Make sure to get your pledges in and secure your exclusive rewards. Some of these items (the Backer Edition Hardcover Book and the original art within the Completionist Tier) will never be available again outside of this campaign. You will be able to buy them after the campaign ends ONLY IF you are a backer before the campaign finishes. Otherwise, as I’ve promised to backers… they will be gone forever. So, if you want to own a really special part of Dreamprism Press’s history, this is your last chance to get on board! The standard edition book and other items will be available to purchase separately in the future. Immediately following the campaign, the BackerKit store will go live, allowing you to buy more copies of the book (the Kickstarter structure allows only one reward per backer). I’ll post more details soon.